Notre Dame Priory, Hennebont, Brittany. Taillevent wrote an historically-important French cookbook called “Le Viandier” towards the end of the Middle Ages. Suggested dates for the book include 1375, 1380 and 1381. There were at one point five different versions of the manuscript, ranging from a rolled piece of parchment reputedly from the second half of the 1200s before he was even born (sic), to one from 1604. Four are still extant. The oldest manuscript is in the National Library of France, the other three are in the Mazarine, Manche à Saint Lô and Vatican libraries. Many copies circulated, copied out by hand at first; the first printed edition was probably in 1490. The later the version is, the more that has been added to it by the people who copied it out. That there is even one copy with the core material in it, dated from before he was born, might mean that Taillevent himself simply enlarged on a previous work, just as others after him kept on adding to it. Some sources even speculate that Taillevent wasn’t involved in the book; that it was instead the kings Philip de Valois or Charles V. If it was Charles V, then it may well have been written prior to 1380 when Charles died. In any event, the cookbook mostly records what royalty would eat. It is medieval cooking. It records heavy, heavily-spiced dishes, spicy sauces, soups, and stews, verjuice, and the use of roasted breadcrumbs as a thickening agent instead of flour, which came later. Roasting and boiling are the most common cooking methods. There is great attention paid, as would have been necessary, to Church feast and fasting days, when religion completely dictated what should be eaten. Taillevent’s real name was Guillaume Tirel. 1310 — Taillevent is born Guillaume Tirel in 1310 or 1312 in Pont-Aude-mer, Normandy, the eldest child of his parents. Baron Jérôme Pichon and Georges Vicaire in 1892 put his birth in 1326, but thinking now favours the earlier dates. In his career, Guillaume would simply go the by name of Taillevent. 1326 — Taillevent was working as a kitchen boy responsible for turning spits in the kitchen of Jeanne d’Evreux (1310-1371), Queen of France. 1328 — Philippe de Valois  (1293 — 2 Aug 1350) was crowned King Philip VI when Jeanne d’Evreux’s husband, King Charles VI, died leaving no heir. Taillevent became Philippe’s cook (“queux” in the old French) and Ecuyer (“squire”) de l’Ostel de Mons. 1350 — Philippe died in August. Philippe’s son, “Jean le Bon” (16 April 1319 – 8 April 1364, aka John II), came to the throne at the age of thirty-one. 1356 — “Jean le Bon” was captured by Edward III, taken back to England, and imprisoned (in style) from 1356 until 1360 and again in 1364. Back in France, the Duke of Normandy sat in as protector of the realm; Taillevent cooked for him. 1380 — Charles V died. His son, Charles VI (born 31 Dec 1368 — 21 Oct 1422) came to the throne, aged eleven. 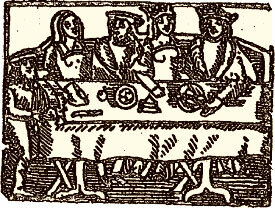 Taillevent was promoted to “Ecuyer de Cuisine” (“squire of cooking”) for King Charles VI’s court. 1388 — Taillevent was promoted to Premier Ecuyer (“first squire”) of all the royal kitchens, a position he retained until 1392, when he was approximately 80 years of age. 1395 — Taillevent died, and was buried at Notre Dame priory at Hennebont, Brittany. 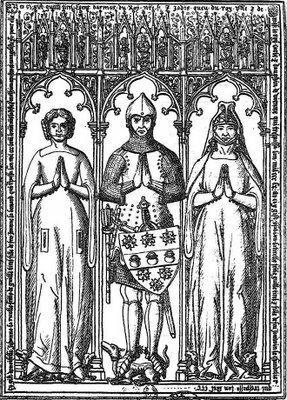 His tomb shows him in armour, with his first and second wives on either side. On his shield is displayed his personal coat of arms, with six roses and three cauldrons on it. “Taillevent” literally means “cut wind”. The present writer hastens to add, before readers start falling all over themselves, that it means in French a light sail or a jib used for tacking on a sail boat. This was in reference to his very large, pronounced, aquiline nose. It was Philippe de Valois who passed the “gabelle”, the hated salt tax, to finance his wars against Edward III of England. The salt tax would remain in France until 1946.